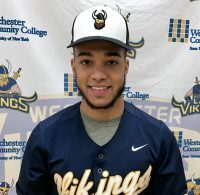 MONDAY March 22 The Viking’s home game against Globe was cancelled because of field conditions……..FRIDAY March 25 The Vikings split a doubleheader with Jefferson CC from upstate, dropping the lid lifter 7-6 despite Austin Pollack (Harrison HS) going 2 for 4 with 3 RBIs. In the night cap The Vikings won 7-6 as Martin Shkrelja went 2 for 4 with 3 RBIs. Both games were played on the turf at Silver Lake Park…….SATURDAY March 26 The Vikings returned to their campus field to sweep a twinbill from Queensborough 12-2 and 13-1. Alonso Tenya (Scarsdale) went 3 for 3 with 3 RBIs in the first game and Brendan Cuni (Harrison HS) went 3 for 3 with 3 RBIs in the second game. TUESDAY March 23 Natalie Messina (Walter Panas HS) gave up one run and got the win as the Vikings opened their season with a home 6-1 win over Queensborough………..TUESDAY March 23 Natalie Messina (Walter Panas HS) struck out 13 and went 1 for 3 with an RBI as the Vikings held off a Queensborough comeback to win 9-6 in Region XV game played on the Viking’s new field…….SATURDAY March 26 The Vikings traveled to Queens to split a doubleheader with Queensborough. They dropped the first game 11-9 as Kerry Ryan (Good Counsel HS) went 3 for 4 with a triple and an RBI. The Vikings won the second game 7-1 behind Natalie Messina’s (Walter Panas HS) 10 strikeouts.